One Nation policies from Wikipedia: Pauline left red faced. Pauline Hanson: Text slabs from One Nation party policies lifted from internet, including Wikipedia. Pauline Hanson’s One Nation Party has copied slabs of text from the internet for some of its policies — including from Wikipedia. Ms Hanson will this year return to Federal Parliament as a senator for Queensland after nearly two decades in the political wilderness. 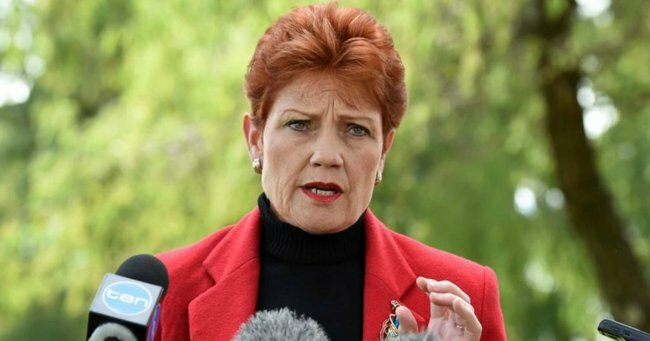 During the campaign, Ms Hanson called for a ban on Muslim immigration to Australia, a royal commission into Islam and a ban on new mosques. One Nation picked up nearly one in 10 Senate votes in Queensland. The party claims it could also win Senate seats in several other states. But chunks of the party’s policies on halal certification, sustainable development and medicinal cannabis have been copied off the internet. One part of One Nation’s policy on halal food — which links the religious blessing to terrorism financing — has been lifted from Frontpage Magazine — a right-wing American “battle tank, geared to fight a war” against the political left. INFOGRAPHIC: FrontPage magazine on halal food. INFOGRAPHIC: One Nation website on halal food. Another section of the halal certification policy comes from the website of the Q Society — an anti-Islamic group which organised for controversial Dutch MP Geert Wilders to visit Australia in 2012. INFOGRAPHIC: Q Society website on halal food. Part of One Nation&apos;s position on the Agenda 21 international sustainable development agreement is almost identical to a five-year-old pamphlet from US group The John Birch Society. INFOGRAPHIC: The John Birch Society pamphlet on Agenda 21. INFOGRAPHIC: One Nation&apos;s position on Agenda 21. A section of One Nation&apos;s medicinal cannabis plan is very similar to parts of a user-generated Wikipedia page on the subject. The Wikipedia entry reads: "The ancient Egyptians used hemp (cannabis) in suppositories for relieving the pain of haemorrhoids." "Surviving texts from ancient India confirm that cannabis&apos; psychoactive properties were recognized, and doctors used it for treating a variety of illnesses and ailments, including insomnia, headaches, gastrointestinal disorders, and pain, including during childbirth," it says. The One Nation website reads: "The ancient Egyptians used hemp (cannabis) in suppositories for relieving the pain of haemorrhoids … In ancient India, doctors used it for treating a variety of illnesses and ailments, including insomnia, headaches, gastrointestinal disorders, and pain, including during childbirth." One Nation has refused to comment.